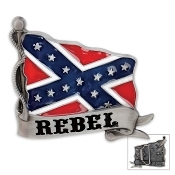 A striking tribute to the Rebel Flag, you can wear this belt buckle with pride and let the world know that you are proud of your heritage. The painted artwork is vibrant and eye catching. The buckle is constructed of a durable metal alloy with sturdy fittings.